French Victorian antique hard stone cameo in elegant enameled mounting: Description by Adin Antique Jewelry. In an openwork 18K red gold cadre, a meticulously carved hard stone cameo with a black enamelled rim is framed within this French Victorian pendant as well as brooch from 1870. As the lady's profile has roses in her hair and as the frame holds two half seed pearls, no detail has been spared to enrich this classical jewel. Technique (01): Cameo is a method of carving, or an item of jewellery or vessel made in this manner. It features a raised (positive) relief image. 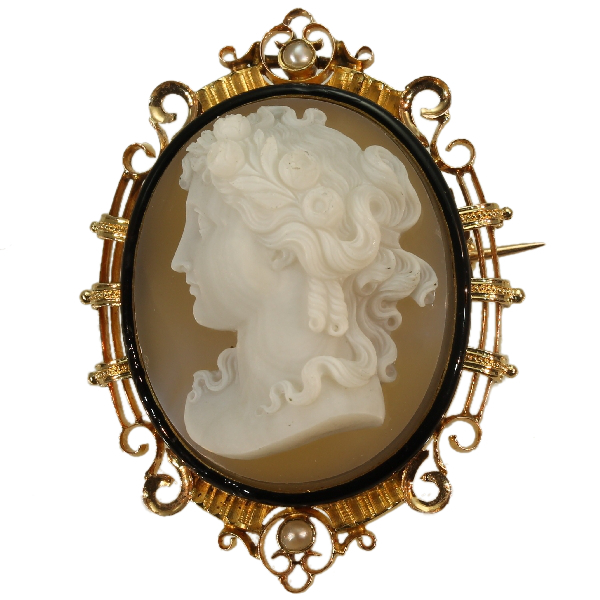 There are three main materials for Cameo carving; Shells or Agate (called a Hardstone cameo), and glass. Cameos can be produced by setting a carved relief, such as a portrait, onto a background of a contrasting colour. This is called an assembled cameo. Alternately, a cameo can be carved directly out of a material with integral layers or banding, such as (banded) agate or layered glass, where different layers have different colours. Sometimes dyes are used to enhance these colours. Cameos are often worn as jewellery. Stone cameos of great artistry were made in Greece dating back as far as the 6th century BC. They were very popular in Ancient Rome, and one of the most famous stone cameos from this period is the Gemma Claudia made for the Emperor Claudius. The technique has since enjoyed periodic revivals, notably in the early Renaissance, and again in the 17th, 18th and 19th centuries. Technique (02): Enamelling is an old and widely-adopted technology. The ancient Egyptians applied enamels to pottery and stone objects. The ancient Greeks, Celts, Russians, and Chinese also used enameling processes on metal objects. Enamel is the colorful result of fusing powdered glass to a substrate by firing, usually between 750 and 850 degrees Celsius. The powder melts and flows and hardens to a smooth, durable vitreous coating on metal, glass or ceramic. According to some sources, the word enamel comes from the High German word smelzan (to smelt) via the Old French esmail. Used as a noun, "an enamel" is a usually small decorative object, coated with enamel coating, such as a champlevé or a cloisonné (different techniques). Birthstones: Pearl is the birthstone (or month stone) for June.